This is the original post about the construction principle of kite shawls from 2017. I found an easier way of explaining the principle which is much easier to understand and published it in early 2019 as an update to this post. Please refer to the updated post here: The Secrets of Kite Shawls (2019). This article is kept for historical reference only. 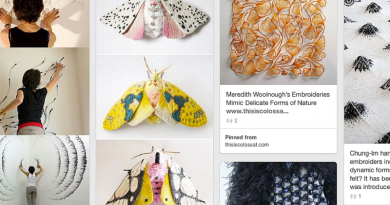 Kite shawls seem to pop up everywhere lately, the most prominent example being the Find Your Fade shawl by Andrea Mowry. As soon as I saw this shawl I was intrigued by its construction, and honestly, it took me a few days to finally work it out. Kite shawls are triangle shawls with a biased line of knitting. One does not knit them straight but in a V-like shape, similar to chevron stripes. Let’s look at an example. 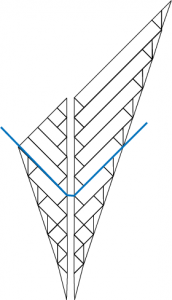 The picture below shows the basic shape of a kite shawl. 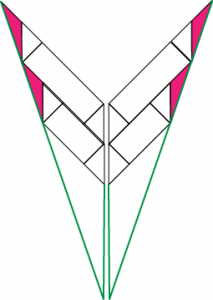 The basic kite shawl shape: an increase section (pink) and a decrease section (green). Every shawl shape can be reduced to basic shapes – triangles, rectangles, and circles as outlined in this earlier post about basic shawl shapes. Kite shawls are no exception. The secret of kite shawls and their construction is how the knitted fabric behaves in contrast to any woven fabric, similar to vortex (cornucopia) shawls, and swirl shawls. 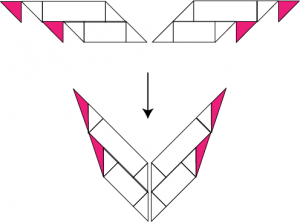 Basically, it’s a triangle shawl – or better, a combination of triangles. 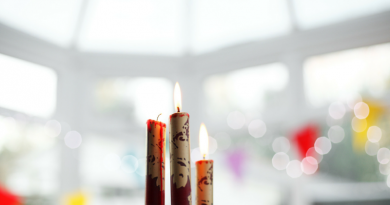 Let’s have a closer look on how to construct kite shawls. 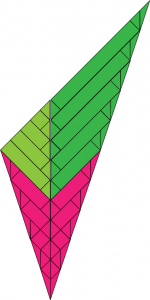 All kite shawls consists of two sections: An increase section (shown in pink in the pictures illustrating this article) and a decrease section (shown in green). Both sections consist triangles and rectangles (eventually). The basic elements in the construction of kite shawls are triangles and rectangles. After the setup, every section consists of a rectangle sandwiched between two of triangles, and additional decreases on the outside (done on wrong side rows) on the right side, and its mirror image on the left side. These two areas are separated by a central spine stitch, usually a central double decrease (cdd). The center spine stitch accounts for the decrease of the first (inner triangle), the increases (outer triangle) is done by working a yarn over or similar increase stitch (an m1 stitch, for instance). So an example increase section look like the picture shown below. 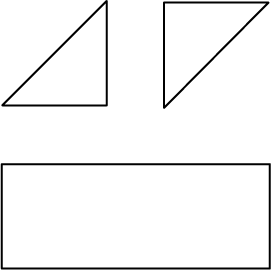 There are three triangles and one rectangle on each side. two of the three triangles account for the biased knitting direction (in total, no stitches are increased or decreased, there are as many increases stitches as there are stitches decreased); the third one accounts for the increase stitches which make the overall triangle grow. Construction of kite shawls: sample increase section. Both right and left sides are shown. Both are separated by a central spine stitch (usually a central double decrease). After putting the pieces for one section together and taking into account blocking afterwards, the result looks like shown in the picture below. Construction of kite shawls: sample increase section. Both right and left sides are shown after moving into their actual positions. The pink sections are the ones affected by blocking. Now let’s combine two of these sections and see what happens. A combination of two kite shawl increase sections. The pink areas are the increase sections of both sides – the ones affected by blocking. Extend the side lines to get an idea of how the whole increase section is going to look like, as shown in green below. Pretty awesome, isn’t it? Now we got the whole increase section (shown in pink in the very first picture) covered. But what about the rest? Let’s continue as established on the right side, but omit all increases on the left side now. 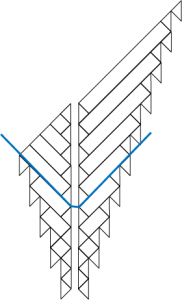 Construction elements of a kite shawl, increase and decrease sections combined. The blue line separates increase from decrease sections. Looks pretty crowed, doesn’t it? But don’t be scared: It’s still only triangles and rectangles after all! The only difference is that we omitted all increases on the left side of the shawl. It looks like a complicated little shawl, that’s for sure. But the truth is, it’s actually quite simple once you get a grip of it. 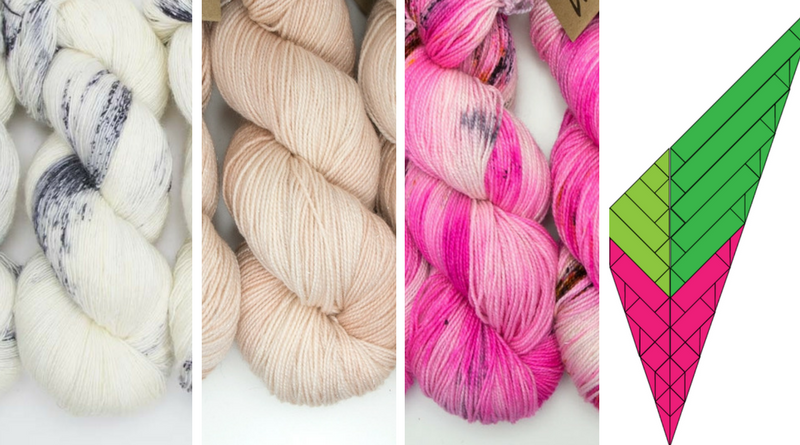 Tomorrow I’m going to talk about how to calculate yardage for each section – we don’t want to run out of yarn knitting kite shawls after all, do we? I mean, not like me the first two times I tried (the third time I ended up with a shawl big enough to cover a whole herd of sheep, but that’s another story). Yes, there will be a pattern template, too. ← What Are You Doing For Killing Time?